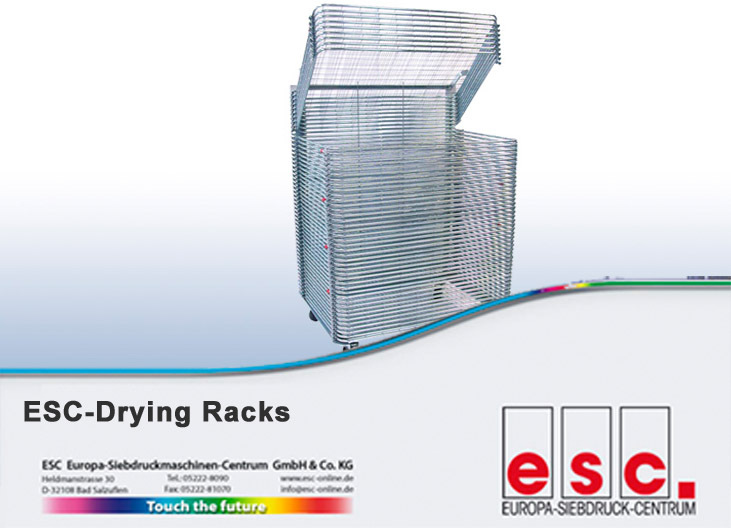 We offer innovative systems for perfect drying results. 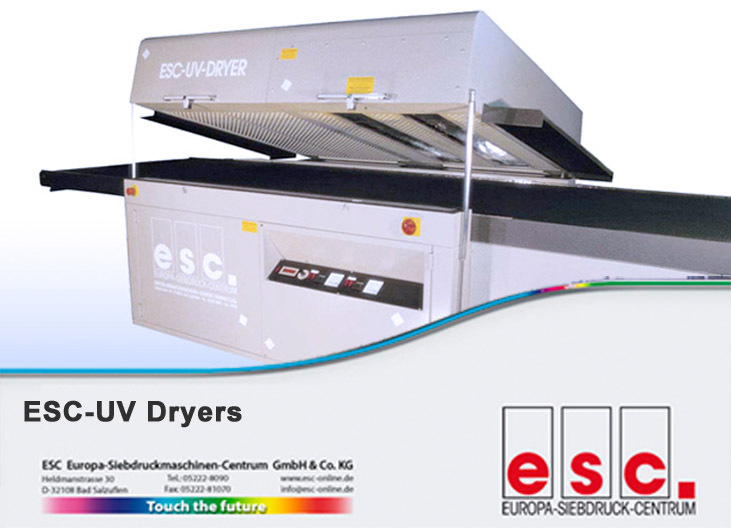 Using the ESC drying systems will enable you to achieve perfect results in the field of UV, IR or hot-air drying. We offer standard systems, modular systems and individual solutions, perfectly aligned to your special requirements. For perfect drying results, we offer more innovative systems. We offer standard systems, combination systems and individual solutions, customized for your specific needs. 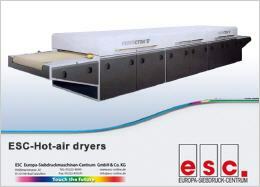 Drying is a crucial factor for the quality of your printed material. Therefore, ESC offers you all below shown drying systems tailored to meet your needs. Tell us your task - you will be impressed by our solution! 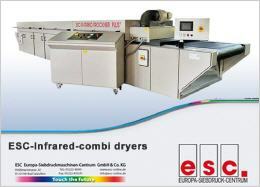 Conventional dryer available in compact and modular design. 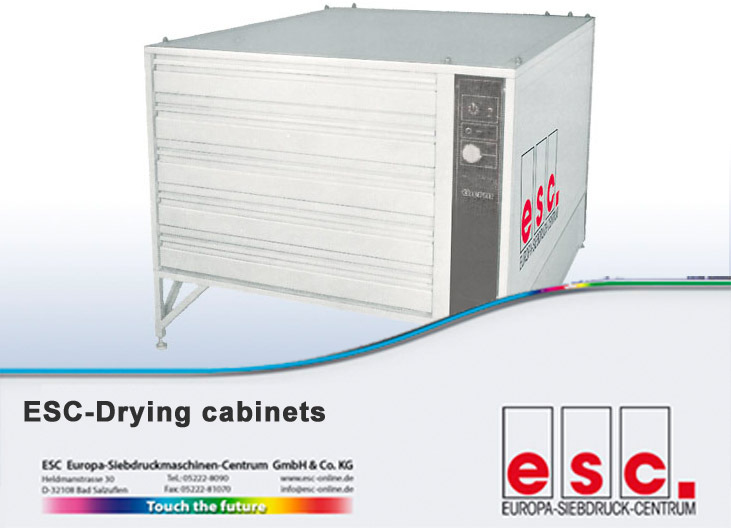 Energy-saving and environment-friendly with an infinitely variable belt speed. More belt widths available on request! 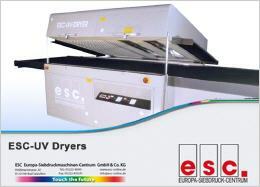 The modern ESC-UV dryers are designed to meet all requirements in UV screen printing. UV curing is carried out in an eco-friendly way and without harming the material, such as paper, cardboard, foils, plastics, glass, wood, etc. ESC-IR high-performance drying systems for demanding applications in graphic and industrial screen printing - offer universal, perfect solutions for drying and fixation of textile, glass and metal colors. The space-saving design allows extensions by additional heating, cooling or UV systems. 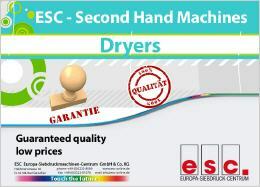 Short drying times and an even air distribution characterize our dryers. The solid construction combined with an appealing design always assures for dust-free results. 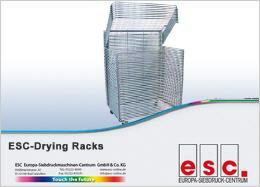 The ESC-DRYER RACK is laid out with 25 or 50 gratings and is available in different sizes. It is covered with zinc-coated, solid grid. 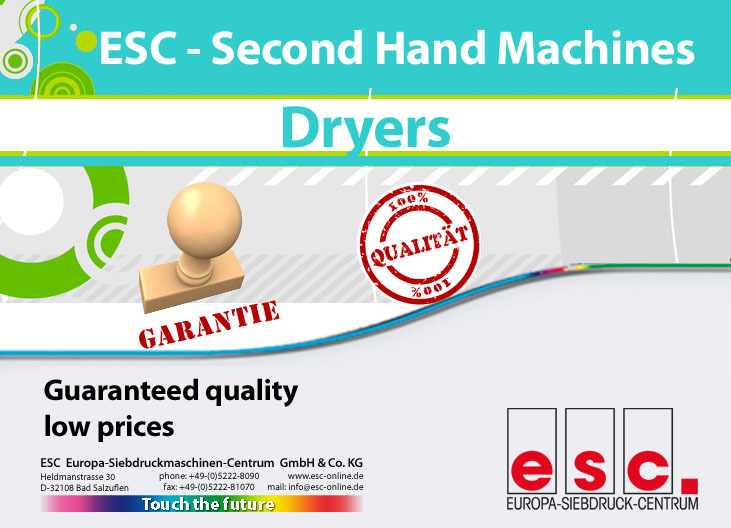 Purchase of second-hand machines is a matter of trust.